Explore the poster-child village of Lindos with its 4,000-year-old acropolis, and then explore Rhodes Old Town with its enchanting medieval sights. The full-day tour is led by a knowledgeable private guide and includes walking tours of Lindos Acropolis and village, the Acropolis of Rhodes and Rhodes Old Town. Learn all about Rhodes historical attractions, and ogle must-see sights including the Palace of the Grand Master of the Knights of Rhodes. All entrance fees are at your own expense. Start your day trip at a time to suit your schedule, and then leave your Rhodes hotel by minivan with your private guide. Travel by air-conditioned minivan along the islands east coast and gaze out of the window at some of Rhodes most beautiful beaches. Pass through several sleepy villages, and finally stop in Lindos, the islands famous ancient village. Lindos pretty streets are fringed by the sugar cube houses found on many a Greek island, but its the magnificent 4,000-year-old acropolis that gives the village its star appeal. Work your way up Lindos gently winding cobblestone streets, and head inside the acropolis to explore with your guide (own expense). Have your camera ready to capture sights of the ruined Byzantine fortress and an Ancient Greek temple, and gaze down at the sweeping Bay of St Paul. After discovering the delights of Lindos Acropolis, make your way back into the village to visit one of its picturesque churches. Then, leave Lindos and travel to the nearby village of Haraki for a leisurely Greek lunch at your own expense. 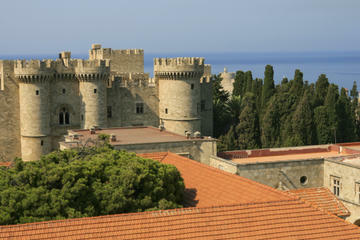 Feeling refreshed, return to your minivan and travel along the coast to Rhodes Old Town. Your next stop in the afternoon is at the Acropolis of Rhodes, one of the few acropoleis without fortifications. Stroll around the sites Hellenistic monuments, admiring the ruins of a stadium, the Temple of Apollo and more. Continue with a drive along the old city walls to Porte dAmboise, and then stretch your legs on a walking tour around the Old Town. Stroll down the Street of the Knights, admiring its medieval buildings with their impressive facades, and stop for photos by the Palace of the Grand Master of the Knights of Rhodes. Enjoy some free time to explore on your own  perhaps visiting the palace and its museum at your own expense  and then meet your guide to travel back to your hotel. Your day trip finishes with a drop-off at your Rhodes hotel.